You can cook rice by boiling it in an ordinary pan. However, the results can be inconsistent. Not to mention that boiling rice in an ordinary pan leaves you with the trouble of keeping an eye on it, checking at regular intervals so it isn’t over- or undercooked, and draining out the excess water once done. With electric rice cookers, it’s time to rest assured that your rice won’t be overcooked or under cooked. This kitchen appliance is used to prepare perfect rice to enjoy anytime. It is designed for boiling or steaming rice on electric power. The appliance knows when to decrease to simmer and when heat has to be lowered for keeping the rice in serving temperature. These cookers are not unit askers to go by their names. Besides rice, you can also experiment with other dishes. Boiled eggs, oatmeal, pancake, cheese, beans, other whole meals, breakfasts, side meals, and many more can be prepared in this appliance. Automatic best rice cookers were developed in Japan called suihanki and are an uncomplicated and convenient kitchen appliance used to cook or steam rice. Ceramic rice steamers were used dating back to 1260 BC. Electric rice cookers eliminate standing at the stove watching the rice cook and not stick and burn to the bottom of the pot. You simply rinse the rice if that brand rice suggests doing so, and add the correct amount of cold water and rice to the cooker and turn it on automatically. The interior pot is removable to serve from and then wash. The cooker has a heat source, the cooking bowl or interior pot, with a thermostat that calculates the temperature to cook the rice. Some models have many sensors and other elements for other adaptable functions discussed here. A rice cooker is not a pressure cooker or slow cooker. The rice cookers are great for home users and college kids. This beauty comes with Indian menu, preset timer and auto cooking functions. It has a stainless steel body and removable non-stick cooking pan. 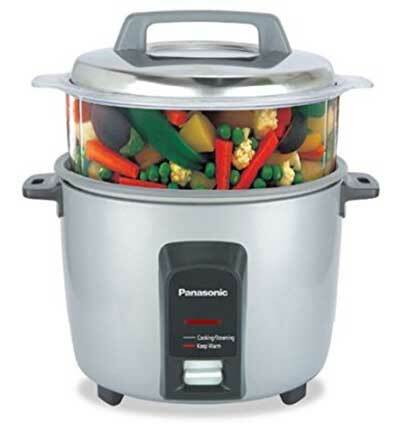 It also has a provision of a steamer, so you can quickly steam vegetables while cooking rice. It has whooping fifteen hours of the preset timer and 12 hours of “keep warm” mode to serve you a hot and fresh food. It also has a unique spillover prevention vent. Using this cooker you can cook the food up to 4 or 5 people. Uncooked rice capacity is 1.8 litre. It’s non-stick inner pot won’t let any food to stick with the vessel. The inner side of the lid is not removable, and it’s a bit hard to clean. 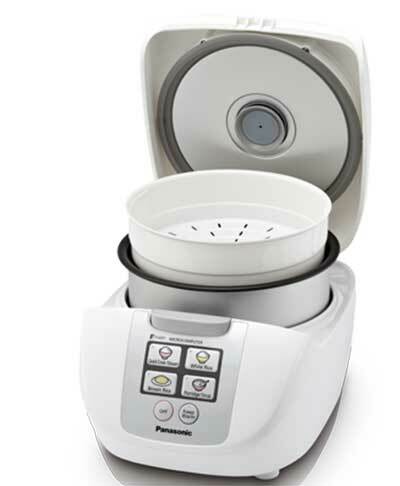 This electric rice cooker comes from Panasonic. It is made up of metal for durability. It has a “keep warm” function for keeping the food piping hot. Fuzzy Logic plays all the magic. It comes with a power failure device. In case of power cuts, it will automatically resume from where it left off (if the power cut duration is around 40 mins). Once the rice is perfectly cooked, the cooker will notify you. 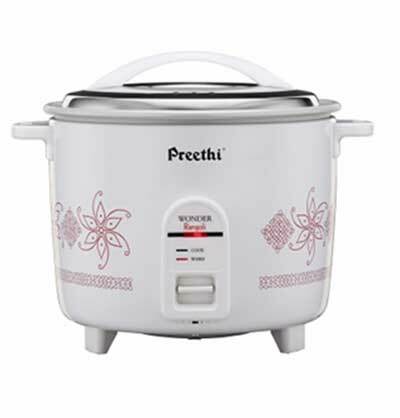 It comes with automatic control for white rice, Quick Cook, Steam, Brown Rice, and Porridge. The size of the cooker is 10 cups of uncooked rice. It’s capable enough to feed up to 6 to 7 people. Comes with a Basket for steaming purpose. Easy to carry, compact and simple. Comes with 2 years of manufacturer warranty. Cooking time is slightly more compared to the regular rice cookers. 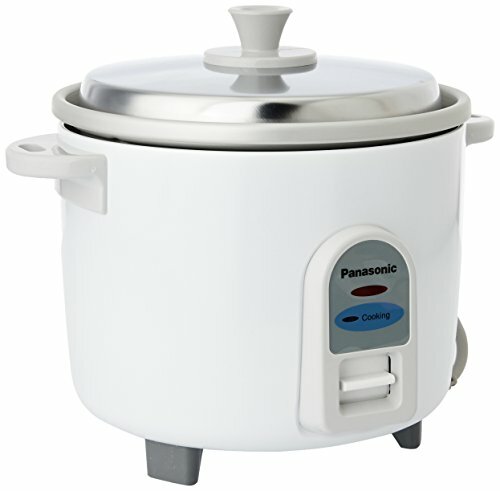 Yet another top rated rice cookers from Panasonic. This electric rice cooker has a non-stick cooking pan which is anchor coated. It also has a crystal clear transparent steaming basket which enables you to steam fish, momos or vegetables. Food stays warm and fresh for up to four hours in the cooker, which means you can enjoy it long after a long time it is prepared. It has a raw capacity of 0.9 litres (1.2 kg), after cooking it is 5.4 litre which lets you cook 2 different dishes at the same time without any issues. Definitely, it’s one of the best electric rice cookers. It has handy bridge handle. Dish separator to cook 2 different dishes. It comes with 2 years warranty on product and 5 years warranty on the heater. Rice filter plate is easily breakable. So handle it with caution. This suitable and easy to use automatic rice cooker gives you a chance to cook different rice recipes for a small gathering of people. 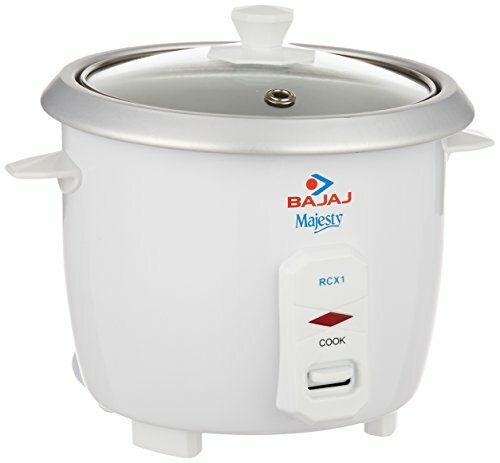 Like all other electric rice cookers, using this you can cook biryani/pulao in a smaller amount of time. It comes with heat-resistant bridge handles which ensures that you have a safe, secure and comfy grip when you hold the cooker. With its clear steaming basket, you can also steam fish or vegetables. Once you are done with cooking, you can leave the food up to 4 hours but still serve the nutritious and hot food. “Keep warm” mode supports this mechanism. Its capacity is 1.8L which can be used to serve 3 to 4 people. Comes with a clear steaming basket. Easy to clean the inner pot. Suitable for only small family or bachelors. 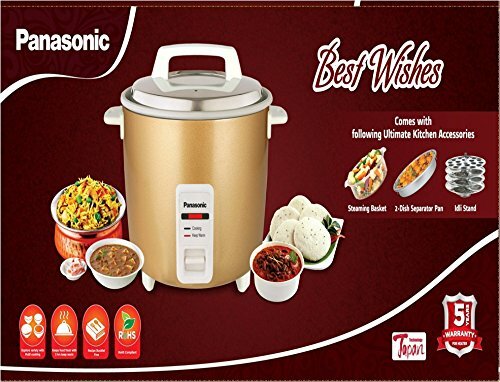 Like all the best electric rice cookers, you can use it to can cook porridge, stew, soup, idlis, biryani, pulao and steam vegetables, fish etc. in a hassle-free way. The cooker body should not be washed. You can only wipe it with the damp cloth. However, the aluminium rice bowl is removable so you can wash it with water. It also comes with a detachable power cord which makes it easy to carry. It supports speed cooking which makes the food so quickly while you are busy in doing some other tasks. Once the cooking is done, it automatically changes the mode to “keep warm”. It can cook up to 1 kg of rice. Additional Cooking Pan is provided. Comes with the steaming basket. 2 years of manufacturer warranty. Detachable power cord is reported as short one. Some consumers report that after few months of using it, “heating power gets dropped” but it becomes manageable. This superb product from Panasonic is made of metal and comes in burgundy colour. It is highly energy efficient. 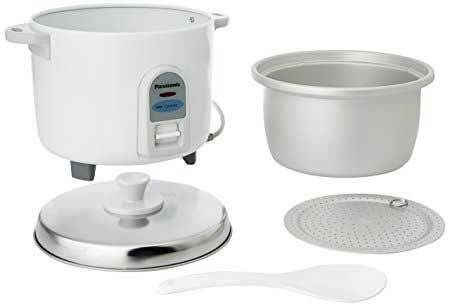 The material of steamer is polycarbonate, and the pan is made up of aluminium. You can easily cook rice and use the double steamer at the same time. Its “keep warm” which lets you taste the fresh food, hot even after the long hours (5 hours) it has been prepared. This rice cooker can cook 1.8kg to 2 kg of rice which is sufficient enough to serve at least 4 to 5 people. Double steamer basket to steam fish and vegetables. Easy to operate and clean. 2 years warranty on the product. No steel or non-stick pan. 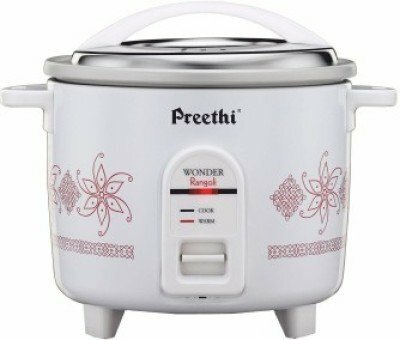 Preethi RC-319 rice cooker can be used to make a wide variety of dishes which includes pulao, biryani, pasta, idly and sambhar recipes. It supports thermostat cut off and it has an overlapped heating coil. Both help in passing the uniform heat throughout the cooking which preserves the nutrients and it makes your food super healthy too. The inner pot is protected by a ceramic seal which prevents the melting of lead and rusting stains, making it suitable for all the years come along. It comes with several proven safety features. Like all other best electric rice cookers, it also comes with automatic keep warm setting which keeps the food warm and fresh up to four hours. You can cook 4 cups of uncooked rice (1 kg) with this cooker which can be used to feed 4 to 5 members. Convenient and simple to use. Easy to clean. Comes with Anodized Aluminum Cooking Pan. Provided with Thermostat cutoff feature. Safety features such as zero shortcut, protection against voltage fluctuations and power outage are provided. 1-year warranty on product and 3 years warranty on the heating coil. This cooker can be used to cook various rice recipes like vegetable pulao, variety rice, and biryani. It is a great, powerful and energy efficient rice cooker which consumes only 660 Watts of electricity to cook your rice exquisitely. During the power cut off, when power resumes after a certain amount of time, it makes sure to not to overcook the rice. This automatic rice cooker cooks the rice in 20 minutes. It features a lightweight and durable anodized aluminium cooking pan. 2 years warranty on product and 5 years warranty on a heater. Does not come with a steamer. The cooked rice might stick at the bottom. 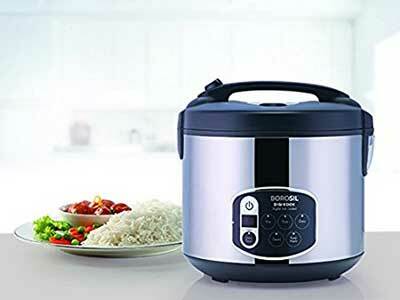 This rice cooker can cook rice and other food items like biryani, pulao, fish, Idli, stew, porridge and vegetables. Using the speed cooking, it cut down the cooking time into half. It comes with a close fit lid made of stainless steel. It supports detachable power cord, using it you can carry this rice cooker anywhere and start using it. It comes with 2 aluminium cooking pans and it can cook up to 1kg of rice. The removable power cord is given so the cooker becomes easy to carry. 1-year warranty on product and 5 years warranty on heating element. The rice might stick to the bottom of the cooking pan. Whether you want fluffy, white, long-grain or toasted, wild brown rice, a rice cooker tends to give better results, without the need for manual observation. But how do you pick the best rice cooker from the hundreds available in stores and online? At BestReviews, we’ve looked at hundreds of rice cookers, from simple budget models to those that offer every conceivable rice-cooking option. We’ve tested them in our labs, consulted experts, and talked with existing customers, all so we can bring you a fair and thorough review to help you with your purchasing decision. At the top of the page, you’ll find our Ten favorite rice cookers. If you’d like more information before you buy, read on for our full shopping guide below. If you’re still on the fence about whether or not you need a rice cooker, let’s examine some of the reasons why you might buy one. If you cook rice frequently, a rice cooker will save you a lot of time and effort over the years. Rice cookers tend to give you much better and more consistent results than most people get when cooking rice in a pot on the stove. These are conventional rice cookers with all the basic components in place. They follow the basics of design and finish. The only automatic feature is that they shut themselves down when the rice is cooked. While these models are the cheapest of the lot (available at $30 in most markets), they are not as sophisticated as expensive models. The lack of non-stick inner pots and light indicators are their major downsides. Plus, they do not have an exceptional heating technology to give you the perfect texture and feel. If you can stretch your budget, having an additional option of keeping your rice warm would be more convenient, especially if you have a large number of people to feed. The keep-warm feature preserves the temperature of the rice, even after you switched the cooker off. The food can be kept for hours, and it will not lose the taste and temperature. 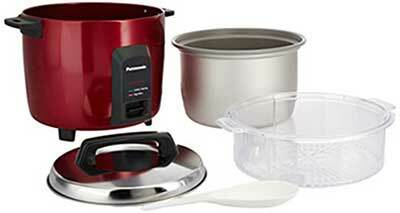 This category contains flexible rice cookers, and some of them also feature non-stick pans and steamers. You can buy these rice cookers for between $35 and $70. In this category of rice cookers, you will get everything modern, from hi-tech design to fluffier rice. Today, rice cookers with fuzzy logic technology are not new to the people, but they are quite expensive. The fuzzy logic technology helps you prepare soups, brown rice, choose rice texture, or even, prepare sushi rice. So, technically, you can cook any rice recipe with fuzzy logic technology. 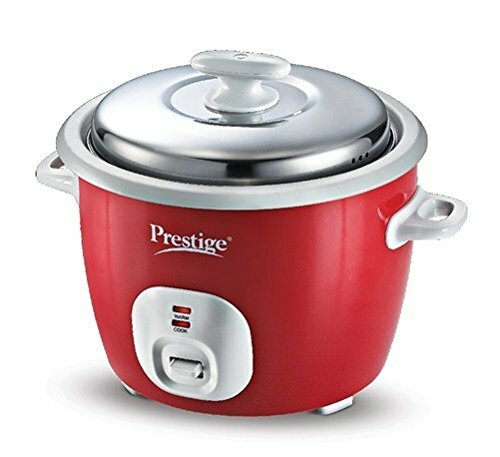 Within this category, you can find the best rice cooker in the range of $130 – $150. That would be a steal if you know your family is crazy about rice, and you will be using it for years. As mentioned earlier, induction heating rice cookers are the most modern of the lot. They are quite expensive, with prices starting from $180, but they are all about precision and comfort. Even if you do not know how to cook rice, induction heating will cover this weakness smartly. If you want to cook brown rice or any other variety of rice, an induction heating unit is the perfect rice cooker for effortless cooking. Just pour the rice, ingredients, and water in the rice cooker, and it will adjust itself according to the item you need at the end. The rice will cook better, look better, feel crisp and taste excellent. There are many excellent rice cookers available, but our top pick is the Aroma 12-Cup Sensor Logic ARC-616SB since it doesn’t just cook fluffy, white rice. 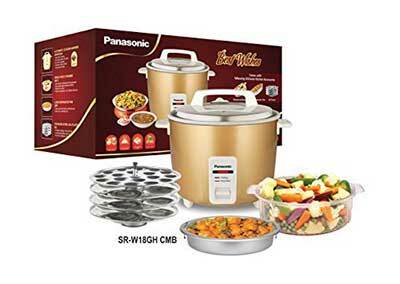 Instead, it gives you considerable cooking versatility with settings to cook meats, fish and vegetables in a steamer basket while the rice cooks below it. This lets you prepare a full meal while messing up only one pot. You can also make oatmeal, soups and even cakes. There is a helpful sauté-then-simmer mode that permits you to gently fry things like chopped onions or other foods in oil, then add liquids like broths. If you want a basic machine that still produces plenty of rice, the Black & Decker 16-Cup RC436 might fill the bill perfectly for your household. It comes with a steamer basket for foods other than rice, and it has a large spoon and a hinged glass lid, as well as a latch on the side of the device to secure the spoon and lid. The lid also features a steam vent, and you get a condensation catcher so condensed water doesn’t drain onto the rice. The rice cooker operates with just one button, and an indicator light on the front of this kitchen appliance will change from Cook to Warm when the cooking is done and it simply needs to keep food warm until it’s time to eat. We also liked the Oster 20-Cup Digital 003071 because it is ideal for anyone who routinely cooks big batches of food at a time. You can make 20 cups of rice at once with this cooker, and it also lets you cook sizeable amounts of steamed meat, fish or vegetables at the same time. 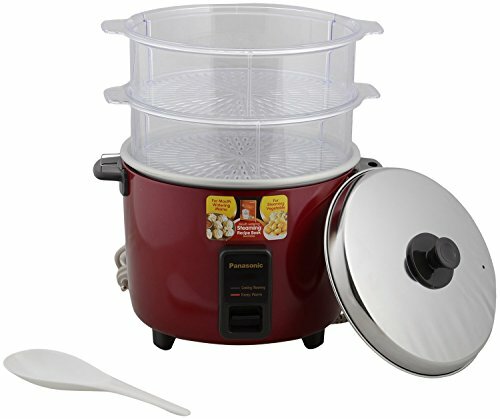 You can also make things like oatmeal and soups with this rice cooker, and it offers a steam-only function. The inside of the pot is non-stick, which makes cleanup easy. Besides the steam tray, you get a rice paddle and a measuring cup. You can save time by preparing rice and water ahead of time and use the delay-start function so the rice is fully cooked and ready to eat when you are. If you simply need a few cups of rice to make a small batch, the Aroma 6-Cup Pot-Style ARC-743-1NG is a fine choice. Despite its compact size, this rice cooker gives you a relatively large steam basket so you’ll end up with full, balanced meals. It is a basic model with only one control on the front, and it will switch to a warming mode once it’s done cooking food. The cooker comes with a serving spatula and a measuring cup. One great benefit of this Aroma rice cooker is that its removable parts can be cleaned using the top rack of the dishwasher. 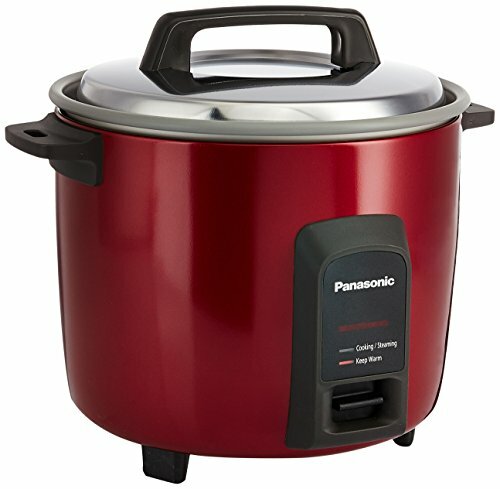 How to Buy An Electric Rice Cooker? The primary goal of any electric rice cooker is to cook a great and delicious meal effortlessly. This feature alone makes the rice cookers worthwhile, as they aim to provide the ultimate result on its own. The following are the basic features, you could expect from any rice cooker. Go through it before we jump into the “Top 10 Best Electric Rice Cookers”. Although it all looks same from outside, inner pot is the one that makes the difference. It may be either stainless steel or non-stick or aluminium. Some rice cookers come with the aluminium coated stainless steel. Choose the one based on your like and preference. Non Stick – This material helps in easy clean up because no food item will stick with the vessel. However, the non-stick coating tends to wear so fast. You need to replace the inner pot once it is worn out. Stainless Steel – Durability is not a problem here. It looks like a new one and gives shiny finish for several years to come. Stainless steel material is little more expensive than all others. When talking about the heat conduction, it is not as good as aluminium. Aluminum – The inner pot made with aluminium is lightweight and a bit cheap in price. It is an excellent heat conductor and not durable as stainless steel. Vessels made with aluminium can bend. Out of all top rated rice cookers, choose the one will serve the best to you. Size matters. Rice cookers are of many shapes and sizes. Make sure to choose a model that fits your lifestyle. If you are single, the smaller, the better, but if you have a family or you plan on hosting parties, you can choose a bigger size. In electrical rice cooker the definition of size often given as uncooked rice, after cooking is done, this uncooked rice will be double the size as cooked rice. For example: if the uncooked rice is given as 5 cups, it would produce 10 cups of cooked rice. It is, of course, the most critical point as some rice cookers have more prominent features than others. Rice cookers often come with multiple cooking settings or functions. In an electric rice cooker, you can cook rice, grain can make yoghurt, soup and so on. To make a particular item, just set the item same by just a single press. A clock and timer are an added advantage. A timer is the rice cooker’s indispensable feature. Now you know the things to look into while buying the rice cookers. By basing the above, we have chosen the list of top 10 electric rice cookers. 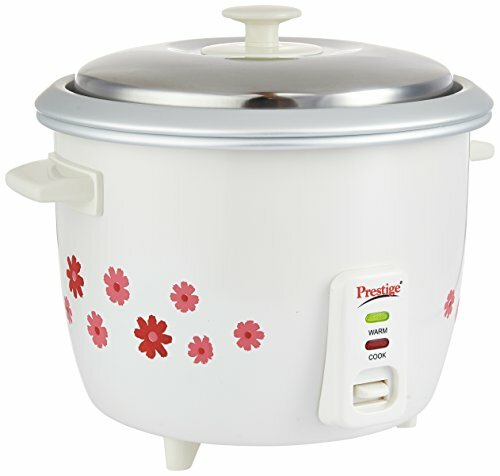 Right now in India Prestige and Panasonic electric rice cookers are so popular. Apart from this, Preethi, Borosil is notable too. Capacity is a key element when looking for an electric rice cooker. You’ll need to consider just how your household eats and which recipes featuring rice appeal to the collective palates of everyone there. Do you need this for only white rice, or will you use it to cook other grains? Consider the size, the pot design, and the features you’re likely to want. Rice cookers measure capacity by the cup and should be used at or near full capacity for best results. Rice cookers generally fit into one of three design styles: pot style, cool-touch style or egg shaped. Pot-style rice cookers are perfect if you are buying your first cooker. Based on the original Japanese design, an inner pot is placed in a rice cooker body and can usually be removed. This design also usually comes with a clear, removable lid. Cool-touch rice cookers reduce the chance of injury by being completely cool on the outside. The lid opens with a hinge and locks during cooking, producing fluffier rice. Most units allow for the inner pot to be removed as well. Egg-shaped rice cookers have a sleek, futuristic look. The design allows for a panel of advanced digital programming in front of the pot. These models are the closest you can get at home to the restaurant quality of commercial rice cookers. Some of the best rice cookers use fuzzy logic, which basically means the machine is programmed to think the same way a human would about cooking rice. It can incorporate non-definitive terms like “slightly” or “almost” in its process, and it can take into account varying conditions. For example, rice often cooks more slowly on a cold day. The machine will consider this and increase the heating element. Fuzzy logic cookers will even compensate for human errors in measurement and allow you to choose the consistency of the rice you prefer. It’s a good idea to choose a non-stick pan because that will save considerable time when it comes to cleaning. Some rice cookers also come with removable parts that can be put in the dishwasher, another great time-saver. 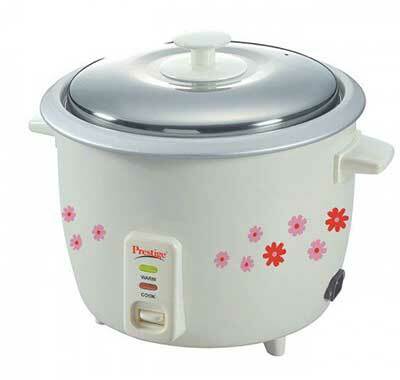 There also are some brands of rice cookers that include utensils, such as attached plastic spoons or steamer baskets. Rice is a staple in nearly every culture, from Spanish rice and sushi rice to Arborio for risotto. A rice cooker is a great solution; you can enjoy fresh, perfectly cooked rice and appreciate the convenience of not needing to constantly monitor the pot. You know that modern-day rice cookers come with lots of features. But, are all the features necessary for you? This is something you need to decide about. Here are some common features put into three categories. They have become essential elements of the best rice cooker. The Lid: The rice cooker lid is available in different materials. While transparency is a must-have these days, the durability of the lid ensures safe cooking at high temperature. You can find rice cooker lids of different materials, such as metal, clear plastic and glass. If a transparent lid falls within your price range, get it. Otherwise, it is not necessary. The Pan: The inner pan or the cooking pot is a must-have in every rice cooker. Nowadays, cooking pans are non-stick, and they are slightly more expensive. We recommend you don’t think about the cost at this point because non-stick pans are a must-have due to the ease of cleaning they offer. Steamer Trays: Some models feature steam trays for steaming vegetables while the rice cooks. There are two ways to steam vegetables: do only vegetables by using the steamer tray or steam vegetables after preparing rice. If you have multiple steamer trays made from perforated metal, you can steam veggies simultaneously. Some models feature a steamer basket to steam veggies above the rice. Multiple steam trays save time and effort. Other units feature a small tray at the bottom, lying just above the cooking element. These units are expensive, but they are more flexible and safer compared to basic models. Fuzzy Logic Technology: It enables you to start with just a press of the button on the menu. It offers multiple functions, such as white rice, brown rice, mixed rice, glutinous rice and more. Quick cooking: When you are running out of time, press the Quick Cooking option to save time. This feature bypasses soak time and takes you right to the cooking cycle. Porridge cycle: If you love slow cooked food, you can use the porridge cycle feature to prepare traditional Asian recipes. Reheat Cycle: This feature increases the rice temperature back to maximum and warms for about 5 – 10 minutes. It then maintains the heat. Texture: Expensive and high-end models offer texture feature. This means you have the luxury to decide the rice texture. You can choose to make it firmer, softer or keep it regular. Fuse protector: Every rice cooker has a fuse protector. It prevents the risk of fire, especially when the appliance is left unattended. Auto cord reel: With an auto cord reel, you can keep the cooker away from your kids and pets. You can adjust the cord length and keep it beyond the reach of your kids. A rice cooker is unlike a typical kitchen appliance. It not only cooks rice but also gives it the perfect shape and taste that traditional cooking pots cannot. So, what are the basic components of a rice cooker? Rice cookers normally consist of the inner pot, which is detachable for convenience. In general, good rice cookers have non-stick inner pots, so that rice at the bottom does not stick, and you can clean the pot easily. The inner pot normally has a stainless steel material for quick cooking. The inner pot goes inside the external casing that provides the heat. The construction of the external pot allows it to retain heat. Rice cookers are electric appliances. So, they would not be complete without a power cord. Pour the rice and other ingredients into the cooking pot, plug in the cable, and switch it on. Leave the rest to this amazing machine. The amount of rice must be measured. It depends on the capacity of the cooking pot how much rice (cooked or uncooked) it can take. If you are putting uncooked rice, the cooking pot needs a little more space, because the uncooked rice will expand upon cooking. Follow the marks in the pot, and add water according to the measurements. Put the lid and secure it properly. It will seal the rice and the cooking pot. The seal helps rice cook quickly because there is no space for air or steam to escape. The building temperature allows the water to convert to steam. As the steam has no way to escape, it builds pressure that in turn, allows the rice to cook fast. The water vapors keep the rice tender and moist. Not to forget the keep warm feature. It activates automatically, as soon as the temperature inside the rice cooker hits a certain point. In general, the entire process takes between 30 minutes and an hour. It depends on a number of factors, such as the quantity of rice, the quality and condition of rice, the heating technology of the cooker, the motor speed, and power supply, etc. Always read the instruction manual thoroughly. Use the handles or knobs and not touch hot surfaces. Do not immerse the bottom part with the electronics in water. Watch the kids that they don’t pull the cooker over on them. Always unplug from the wall when not in use and when cleaning. Always let the cooker cool before removing parts or cleaning. Never use it with a damaged or worn cord or plug. Do not let a long cord dangle over the counter or table top. Never use in the oven or on a cook stove top. If the plug is detachable from the cooker, attach that end first then plug into the wall outlet. Power of 110/120-Volts is used in the USA. If you are outside the USA, buy a converter/adapter for 220/240-Volt usage. Do not plug a 110 Volt into a 220 outlet; you will ruin the cooker. If the appliance is of the grounded type (3-prongs, 1 round, 2 flat), the extension cord should be a grounding-type 3-wire cord. Do not remove the interior bowl while the cooker is on. 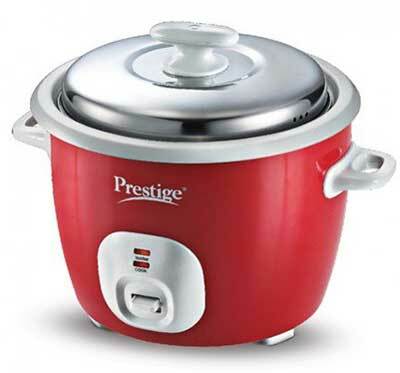 The best rice cookers listed here are sure to please everyone cooking in the kitchen. They free up your time for other things and make delicious rice and meals in one pot. You don’t have to stand and stir adding more water so the guesswork is gone. The warmer keeps food at the right temperature when you’re ready to sit down for dinner. Be sure to read customer reviews to learn of the experiences buyers have had with the products reviewed here.